In July 2008, I attended my first Internet marketing conference. That was my introduction to a whole new world, live and in person. Because of events that happened at that 3-day conference in Chicago, within a couple weeks I was quickly propelled to success in the Internet marketing crowd, being interviewed on radio shows by some of the biggest name “gurus,” being promoted by others, and began speaking on stages across the country about communication and public speaking. Effective communication is a skill you need in any business and Internet marketing is certainly no different. It was a very exciting time. Except over and over again, I kept hitting a brick wall in that marketplace. His name is Frank Kern. Frank Kern has created a persona of himself as “laid back surfer dude done good.” He’s built a wildly successful Internet empire based on his solid concepts and content, which honestly is always good, but isn’t exactly rocket science or anything new. However, because he packages it well and is a master at selling himself, his persona, and his products, Mr. Frank Kern has become a very wealthy and successful man. Good for him. Along with that success, over the years Kern has accepted many invitations to speak on stage to his marketplace, and has recorded dozens of talking head videos. As he should, he maintained his “surfer dude” persona while onstage or on video, typically wearing shorts, t-shirt, ruffled hair and an unkempt beard. And, even though I’ve never met the man personally, he caused all kind of headaches for ME. As a public speaking consultant, I talk to my clients and audiences all the time about the importance of looking the part of a successful business owner and dressing to that image of success. Then here comes Frank Kern, who, dressed in whatever he wore to bed the night before and cursing at his audiences, is hugely successful with a large following. The most savvy of business owners in his market realized all along he was dressed that way and speaking in that manner because it worked for his persona. Keeping up that image was a large part of his success, with the implicit message to others just beginning their Internet businesses, “You can do this too.” That led to an interesting phenomenon. Thousands of 20-something young men believed they could curse and dress like slobs all the way to millionaire status success, because Frank Kern did it. Never mind that persona was completely orchestrated. Like a theme for a party or special event, Frank Kern stayed true to character and his fans ate it up. 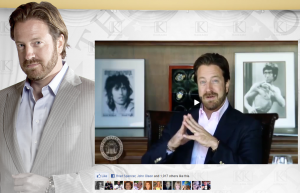 Last week, Frank Kern released what he calls his State of the Internet Address. As you can see from the screen capture of the video, Frank Kern has cleaned up a lot. He’s wearing a custom-made suit. He’s trimmed his beard, cut his hair, and is sitting behind a desk in a large office. As of this writing more than 1,900 people have clicked “Like” on Facebook for the video. In a subsequent post to his Facebook fan page, he talked about how a few people gave him some flack about the new look, but the overwhelming majority of comments were all about how pleased his audience members are to see him cleaned up and dressing the part of a wealthy and successful business owner. Even in our “occupy movement” world, business owners want to look up to someone who is successful. And that means looking the part. He dressed the part. Finally a guy who’s making millions looks like more than a surfer dude, even if only for one video. He was deliberate in his communication decisions and it showed. Here’s the thing: I may not have ever met him, but I’m personal friends with one of Frank Kern’s business partners, and I can assure you, Kern’s decisions about his persona and communication have always been deliberate. But now, with the release of this video, those deliberate decisions are obvious. So what do you think? How do you “look the part” when you speak? Do you think your appearance matters when communicating credibility?